Hi everybody! 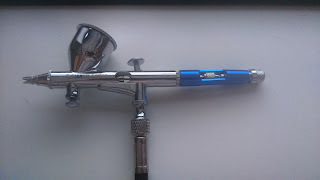 After a year as an airbrush owner I think I more or less have the knowledge to introduce you to this device and give you some super basic advice to avoid you suffering and destroying four guns as I did back then when I started. First of all, I'd like to mention the pros and cons of having an airbrush in comparison with brush painting and spray painting. Although, to be honest, I think all are advantages. You need a smaller quantity of paint for the same surface. The inital outlay is important, but you'll spend less money in the long run. It doesn't leave brush streaks so the finish is totally smooth and even. Finer spray than a regular spray paint, so the working area it's less messy when working in a small place. It makes you able to get some cool effects as gradients. It's not as smelly as spray paints or, better, it barely smells. It depends on the thinner you use, but the difference is notable. Your room won't smell for hours after painting. 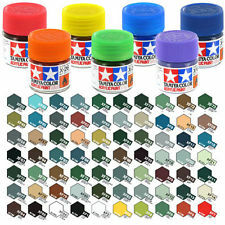 You can do all the color mixings you want and you can choose metallic, chrome and even transparent shades. The only disadvantage I see is that the air compressor is pretty noisy. What the heck is an airbrush? 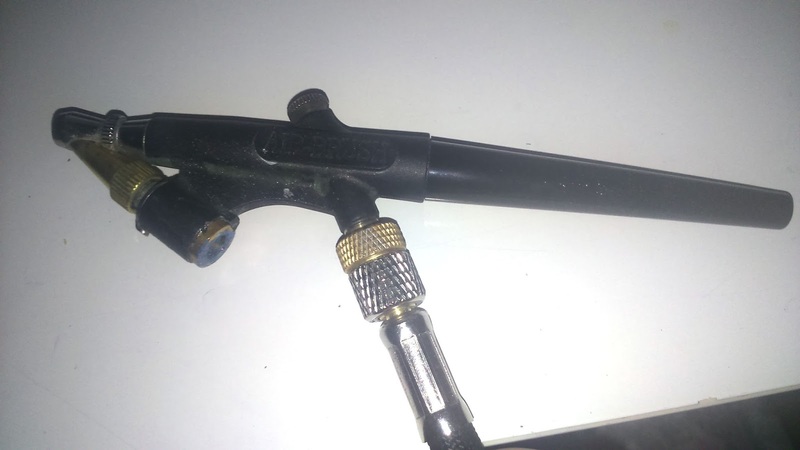 An irbrush is a device for spray paint. The airbrush itself is the gun and it can't function without an air compressor, that is the gadget that blows air trough a hose to the gun. Here you can see the two kinds of airbrush guns I use. 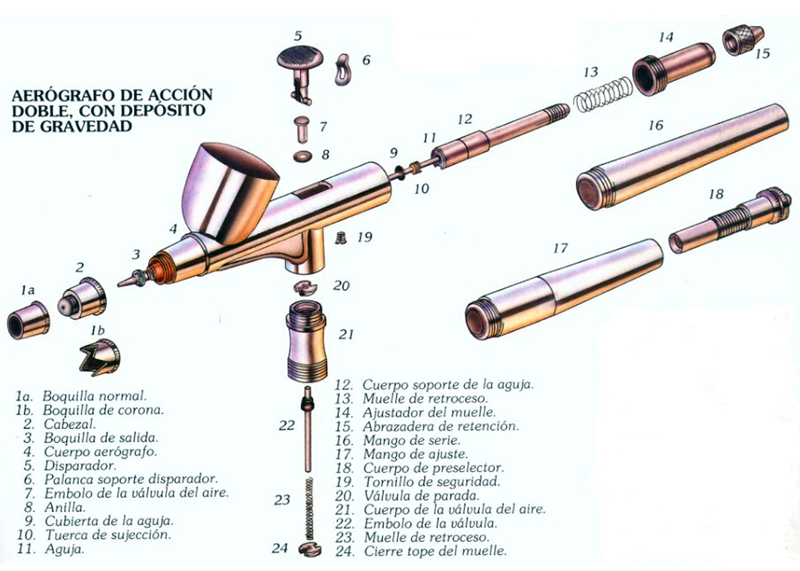 (I put the images in spanish because I didn't find better diagrams in english). 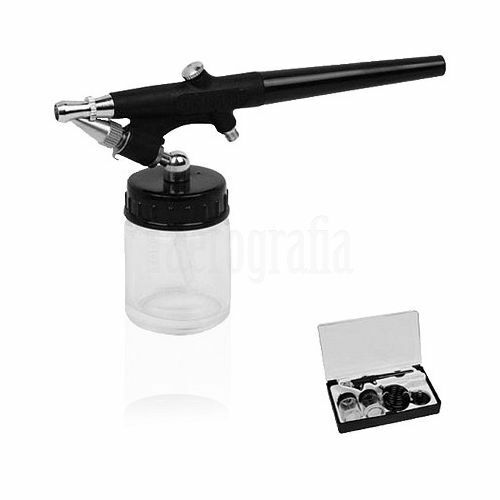 Dual action gravity fed airbrush. 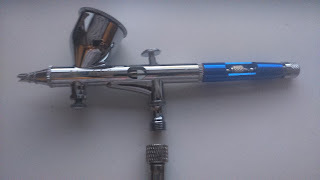 Single action siphon fed airbrush. Single action: With an on-off push button control. Dual action: With push and pull trigger control. It lets you control the air and paint output individually. Gravity fed: The paint tank is in the top of the gun so it gets to the tip by gravity. Syphon fed: The tank is under the gun and the paint reaches the tip troug a little hose. The classic double action gravity fed airbrush releases a thinner stream with a maximum of 5mm mist area. It's fantastic to do little details. The stream width can be regulated by manipulating the back screw that moves a needle back and forth. It can also have a small thread un the lower front part as a valve or safe. This kind of guns work wonders with metallic paints as the metallic particles tend to settle in the bottom of the tank. The single action syphon fed gun has a wider mist area - you can regulate it by rotating the front nozzle - and it has the advantage of having interchangeable bottles so you can switch colors faster and more easily. 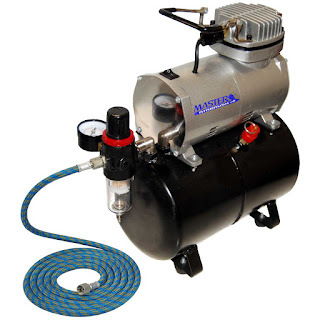 With pressure tank: This is the most expensive kind but the most reccomendable one. The pressure tank stores the compressed air so the device don't have to work non-stop. Once the air is stocked, the engine turns off but you can keep on painting. 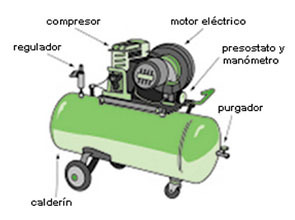 Without pressure tank: This is the cheapest and simplest one (it's the one I have). It has to work non-stop to keep the compressed air flow. 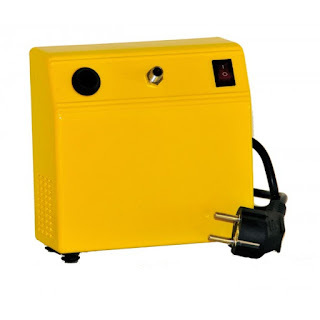 It tends to heat in about 20 minutes so you have to be careful and let it rest from time to time to avoid breakdowns. 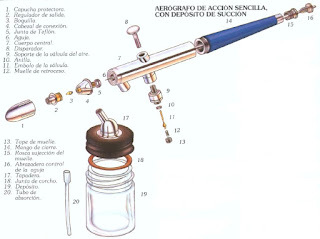 Syringe or dropper: They're essential to measure the paint and thinner proportions. There's usually a dropper in every airbrushing kit but I prefer the syringe as it's more precise and easy to clean. Cleaning tool kit: Very useful to scratch paint remains and reach difficult areas. With brushes and spikes. I'll tell you more in a minute. Bottles: It's quite reccommendable to have a handful of bottles to use with the shyphon fed gun as this way you'll have more fast color change and mixing options. 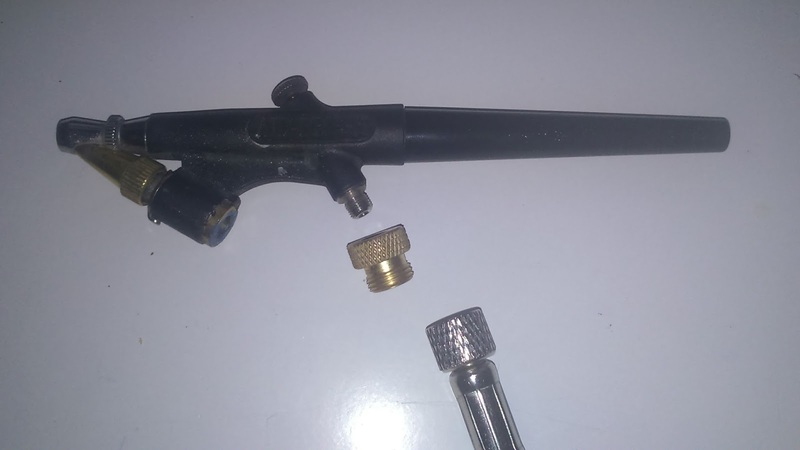 Hose adapters: Hoses and guns sometimes come with different screw diameters. The most common screw is the 1/8" one, but the syphon fed gun usually has a 5x0,45" screw so there are adapters for all models. 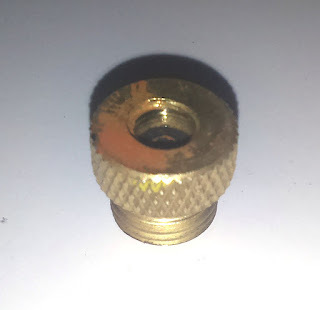 1/8" male to 5x0,45" female adaptor. This is the part that made me cry when I started. Right after buying my first airbrush the shopkeeper (a very expert guy indeed) told me how to disassemble it to clean it. WRRRROONG!! Don't dissasemble your gun unless it's strictly necessary because it has very delicate parts that, once you pull them apart, lose their air tightness and the gun won't work anymore. There's mainly a piece (number 2 in the first diagram) that comes coiled with a toric rubber and a concrete pressure that needs to keep it that way in order to function properly. So, if you don't have to, don't touch it. Use the brushes to remove paint remains from the tank and surrounding areas. Use the spike to remove dry paint from the tip and air output. Fill the clean tank with hot water and spray until there's no remaining paint. You can also use thinner or alcohol for this purpose. By following these simple steps you'll keep your airbrush nice and clean. You can use almost any kind of paints if you know which thinner you can use with each one and its proportion. For instance, my Tali visor was painted using light bulb lacker mixed with trementine. 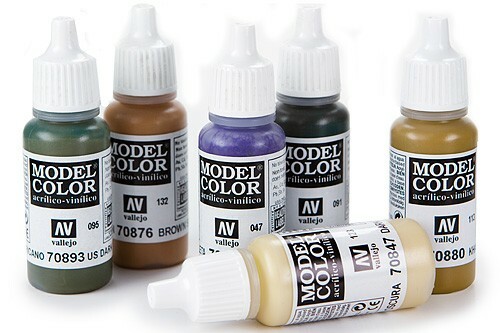 But I must say the paints I use the most are Tamiya Acrylic and Vallejo Model Air. In my experience I prefer Tamiya because I've never had any problem with that brand, it's never got stuck in the gun and it even works with the thinnest nozzle setup. Besides that, paint comes out in a super thin and almost dry mist that sticks perfectly to any surface with no dripping at all. It works wonders and it has a huge color range even transparent ones and varnish. You can find the X type paints with glossy finish and the XF with a matte one. Plus, you can buy the X-20A thinner that, mixed in a 50%-50% proportion with the paint works fantastically well. Vallejo Model Air are tougher to use in my experience. The thinner proportion must be a little higher, like 60% thinner-40%paint (if I remember correctly) though I usually dissolve this paint in water and that's maybe why I'm not satisfied with the results. In fact, shopkeepers usually tell me Vallejo is far more popular tan Tamiya nowadays. It also has a huge color range. I specially love the metallic shades and they also have different finish varnishes. 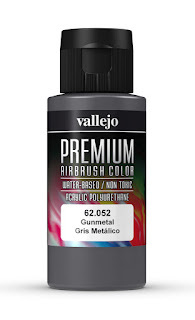 The Premium gunmetal from Vallejo is the perfect metallic color. They usually say that you can use water or alcohol as universal thinners. They work, but it's better if you use each brand's products. Don't confuse Vallejo's Model Air with Model Color because you'll become crazy. The bottles look alike and I've sometimes purchased Model Color to use with my airbrush so I meesed it up big time trying to dissolve it till I realized I wasn't using the right paint. Model color is fantastic to paint with a brush, but it doesn't work for airbrushing, it's a pretty thick paint. The airbrush has been previously dissasembled and it's lost air tightness. I don't know how to fix this. IT'S THE END. The gun is not well connected to the hose. Check both airbrush-hose and hose-compressor connections. In my experience 100% of the time the problem was in the airbrush-hose conection that was too tight. Just twist it a little bit up and down till you find the right point. I kow this section has been quite stupid but I can assure you it took me months of despair and broken guns till I found how to fix this issue. So I hope you find it useful. And that's all my knowledge in this subject by now. At least I can paint things which is nice. Hope you find the answers to your basic airbrushing questions in this little guide. And if you're familiar with airbrushing, feel free to critique and leave some comments down below. When spraying metallics, sometimes best to base area in black first. Using templates for large areas helps prevent overspray. I like to print out shape on paper, then tape clear plastic over it overhead projector plastic) and cut out the shapes using a craft knife/scalpel etc.